I tried searching the site using a few methods and couldn't find a dedicated thread for making bitters - it seems like a good one to add! I've been trying out a number of different bitters over the last couple years (using the standards along with Fee's as kind of a baseline and checking out ones from places like Scrappy's). I'm starting to get a little more adventurous in the types I'm making and was wondering if anyone has any recipes they really like, or small batch producers to recommend. I'll post more info on what I make as it progresses. This thread's a bit old, but a good starting point. Also, this article about DIY bitters is a good read. Here's another good article about making your own bitters. Bittercube out of Milwaukee - RAB turned me onto these - they're spectacular. $10 per bottle or $50 for the 6-bottle sampler (this is what I'd recommend getting) at Binny's. The Cherry Bark Vanilla and Blackstrap are great with whiskey drinks (I tend to default to Cherry Bark Vanilla for bourbon-based cocktails, and Blackstrap for rye-based), and there are few citrus-y cocktails out there that don't benefit from 4-5 drops of Jamaican #2. Bittermens out of Brooklyn - I first learned about these from the manger of Frog N Snail in Lakeview East...she's really into cocktails and cool/unique spirits & bitters. They're using Bittermens Orange Cream Citrate in the Upper East Sider cocktail, and may have a couple other Bittermens varieties behind the bar, because she was really pumped about their bitters and was eagerly awaiting the day they become available here (until then, you can order them from Amazon, among other online sources). Get yourself a copy of the wonderful Bitters by Brad Parsons. It contains all sorts of historical information, contributions from key people in the field, and many recipes. Attrill wrote: (using the standards along with Fee's as kind of a baseline and checking out ones from places like Scrappy's). Please don't aspire to these! Glycerin-based, their only real use as far as I can tell is that most of their offerings are alcohol-free, so if you happen to be making drinks for non-alcohol consumers...? Thanks for the great references! Especially for the small producers. I've been working with Parson's Bitters book recently and that's what's inspired me to try some new things (I've been sticking to Angostura knock offs and citrus styles to date). I'm using Fee's as a baseline not so much as something to aspire to, but just because I've become familiar with them over the years. I do a lot of gardening, woodworking, and grilling so when I look around my garage I see all sorts of things I suspect will work well in bitters - sassafrass wood, apple bark and wood, Chiltepin peppers etc. I think I'm going to start with tinctures on some of these and see where they lead me. I'll second Bittercube, even though I've only tried two of them. They also make a few limited-production bitters. I buy them at In Fine Spirits, but I know Binny's also has them. Found a new thing to try today - Arugula seed pods. Just picked a bunch and am letting them dry. Attrill wrote: Found a new thing to try today - Arugula seed pods. Just picked a bunch and am letting them dry. Very interested in what you're doing with this--I have a whole pot full and have always wanted to find something to do with them. And I've been interested in tackling making bitters so maybe I'll join you in the experiment. Need to buy that book. The Arugula pod tincture I made turned out pretty well! I strained and bottled some of it the other day and it certainly tastes like Arugula, kind of grassy with a bit of a spicy kick. I tried a few drops in some vodka and it seems like it could work well in a Bloody Mary. I'm trying to think of other drinks that could use a dash of grassy/spicy. Okay, not a drink, but this seems like a tailor-made addition to gazpacho. For that "whatever did you put in this? It's perfect!" reaction from your friends. Cienfuegos (Charlotte Voisey) in NYC used to serve a punch with Flor de Cana Nicaraguan rum, Watermelon juice, Pink peppercorn, arugula syrup, and celery bitters. I bet you could do a riff on that by using just regular simple syrup and your arugula tincture. Add all the ingredients to a shaker and fill with ice. Shake well and strain into a cocktail glass. Garnish with fresh arugula sprigs. 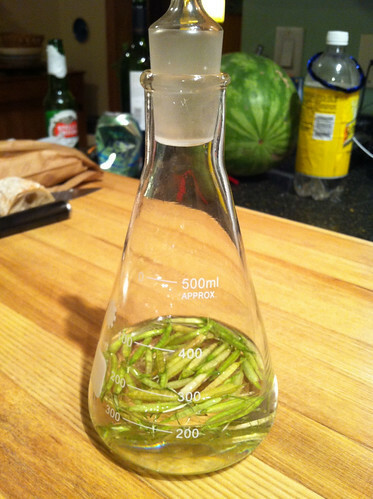 Add several arugula leaves to simple syrup (equal parts sugar and water) and let steep for up to 12 hours. Taste the syrup often until you like the flavor. Once it’s ready, strain the liquid into a clean bottle. Thanks for the great ideas! I'll definitely have to try both. I've got a wotermelon on the counter I've got to use soon and my tomatoes are just starting to come in. Here's my update - Arugula bitters in both Bloody Marys or Gazpacho work very well. I haven't found much else they work well in, but they're wonderful in either of those. Most recently I made an Orange/Cinnamon bitters that I'm really liking, as well as a burnt Cherrywood tincture that should very well with some Fall cocktails. Great to hear the success of the experiments. As I was reading, one other thought occurred to me: anything made by Cynar. As it's an artichoke-based liqueur, it just might work; hell, maybe even in Cynar on the rocks. This year, I'm flush with makrut (nee kaffir) limes. Bitters seems like a natural, as the skin has a lot of aromatic qualities. Does anyone have a local source for the bittering agents? I don't expect to do this often, buying a small amount would be best. Galangal, coriander and cardamom are likely additions (although I saw a cocoa nib suggestions somewhere... but don't know what kind of cocktail I'd make with that). Last time I was at Epic Spices they had a whole (narrow) wall dedicated to bittering agents. I really like that store and if you're willing to head to Chicago just west of Ashland I'd recommend stopping in. Owner is very friendly and helpful. Last time I needed bittering agents (and I still have a bunch, if you want them !) I went to Merz Apothecary and got everything I needed. I would call and ask, to be sure they have what you need. I did and they had it pulled and waiting when I stopped in.